← Hot tired and tired and shattered but exstatic! What a flipping day it has been and the ‘to do’ list is still as long as my arm! So I didn’t unpack the kiln till this afternoon, blimey what a vision! That shiny glazed jug you see is a re-fire so don’t get too excited about that. It’s blooming exciting though even though it’s all over the place. So many things to change next time. Let me at it I want to do it again now! Here are all the ducks. The heat did not in any way shape or form circulate before it went up the chimney. It hit the fronts of the pots and then made it’s merry way skywards. So I have some lovely fronts to some pots, properly melted and the same pots have backs that look like the glaze would still wash off. Almost all are dunted but I could hear that happening as I was trying to clam it up. I was expecting that because of the amazing amount of holes in there. I might invest in some ceramic fibre or just spend a bit longer building it next time and splat some clay in the gaps. 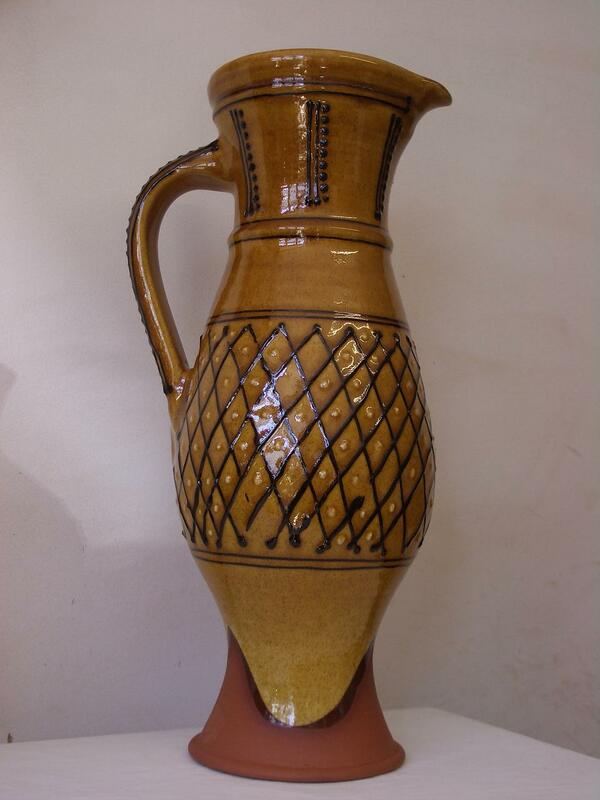 This little jug below is the best I think. I know way too much ash flying through from the fire box but I’ll know that for next time. 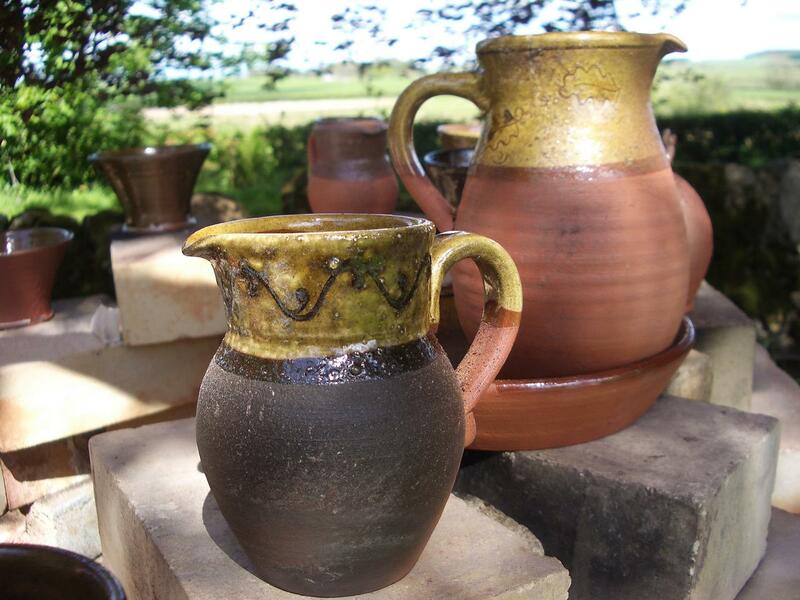 Lots of blistering on the pots that did have melted glaze but look at the clay on that little jug. Yummy. I want another go, rebuilding it a bit first though. I still can’t believe the glaze melted at all, that is just marvelous. 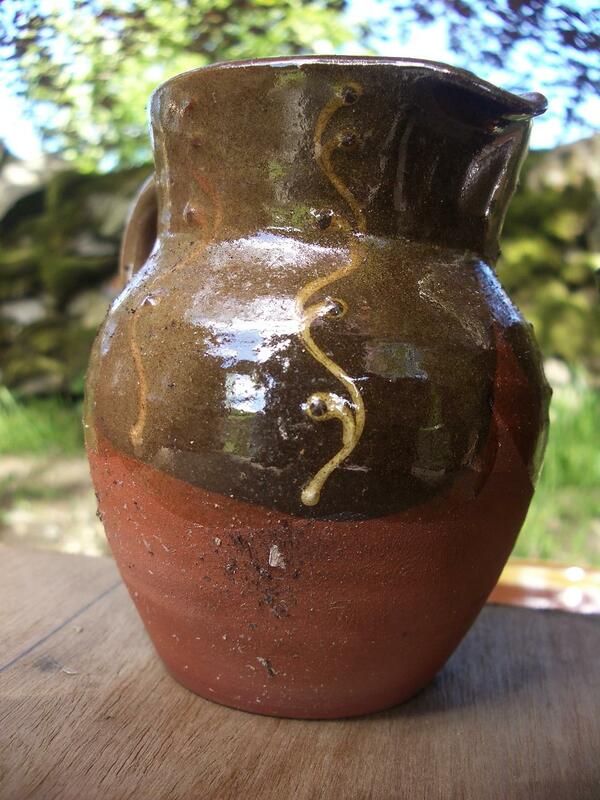 New pots out of the electric kiln too, I love this one. I’ve been trying to sort myself out for the weekend today. Spring Fling is upon us again. It does fly around so very fast. 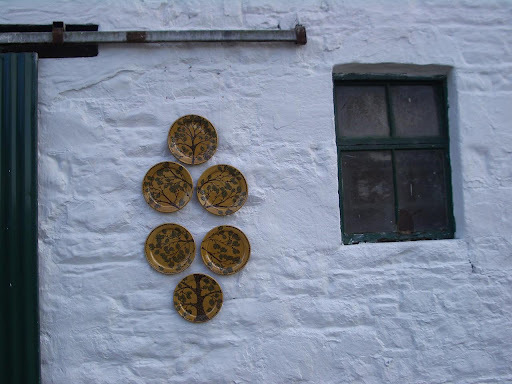 With Paul’s help I got my plates hung on the wall of the barn. The big chargers are up outside too, but they look so small up on those huge walls. I might not be back now until next week, but I’ll try to call in and let you know how it goes. I’m just putting together a bit of blurb about the whole wood firing thing for people to see when they are at the kiln site as of course I can’t be in two places at the one time. My wee sister is coming over to give me a hand tomorrow so that’ll be fun. She’s is brilliant at talking to people so she’ll help man the fort. 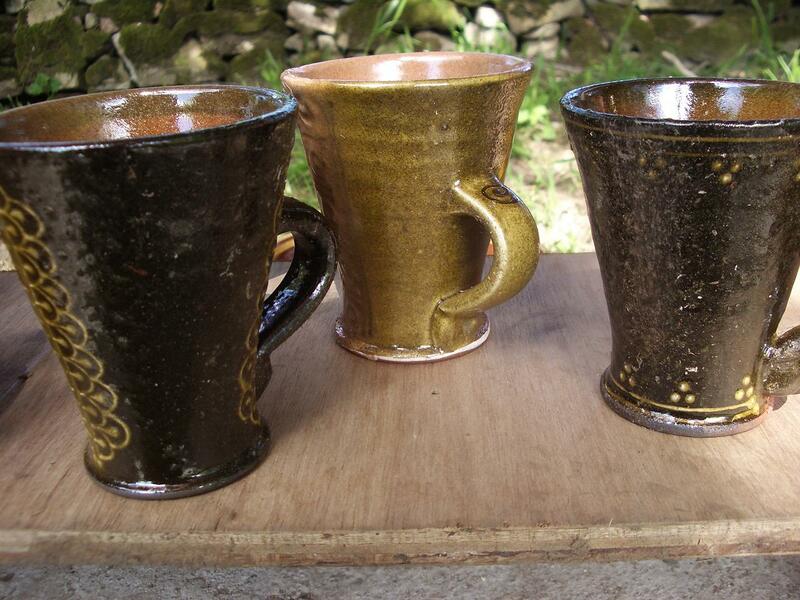 This entry was posted in baluster jugs, Spring Fling, tree plates, wood fired pots. Bookmark the permalink. Briiliant 🙂 What a mess 🙂 But brilliant 🙂 You know how I feel now.The clay on that little jug is glorious. And the ash will enrich the glaze once you work out how to stop it bloating (a nice hour long oxidised soak I guess, and beware of the reduction – no flames out the chimney and black smoke. 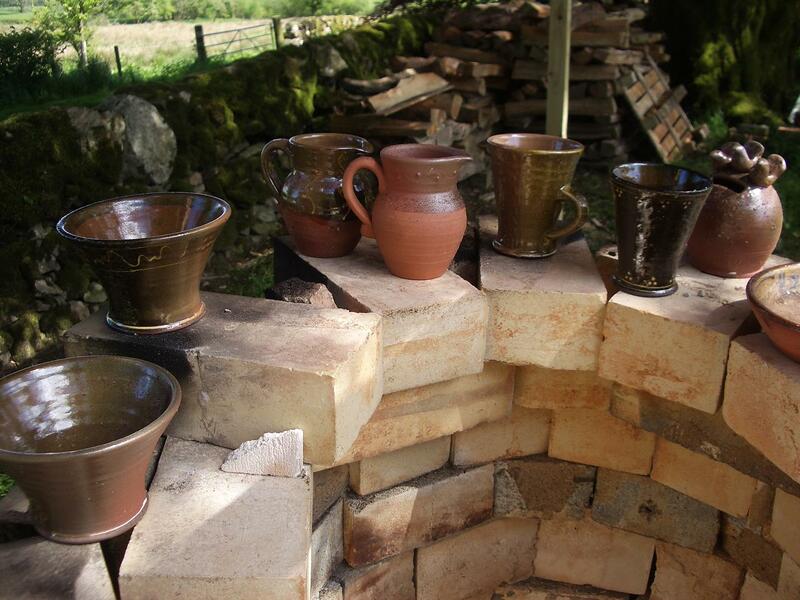 )How did the Bideford kiln work? I’m sure Doug will have some ideas about the heat circulation. (Isn’t the Bideford kiln in one of the Gregory books? )You don’t have a flue as such, but I’ve been trying to think how you might baffle what you have. All I can think of is to perhaps suspend something like a fibre pad or something inside the chimney (but you don’t want it to act like a damper, so hanging right down so the exit area left around it is about the size of your stoke hole opening?) That might reflect some of the heat/flames back down again and help it circulate. Not quite sure how you’d suspend it though.For the holes you could just use a clay and vermiculite layer – cheaper than fibre I would guess and prettier. But then fibre is always useful to have – I don’t know how I lived without it.Well done on doing it though 🙂 Isn’t it fun?That jug is splendid. I was going to offer to come and help this w/e but no way to get there after the car fiasco – hope all goes well. Damn, Hannah, you don’t waste any time. I would stand there and stare at the pile of bricks for days. A good start, I’d say. Any start is a good start.And thank you, your little bowl and the bag of Solway Firth mud arrived this afternoon. I’ll put it on the blog. I’ll trade you some Antarctic mud for it. Way to go Hannah. Not bad for the first go. Have a good weekend, I hope Spring Fling is a success. far out thats amazing…well done H lovely mug in the vid..
Blimey you fired it!interesting results I love it when you glimpes of greatness. This is a really good first go. I really enjoyed reading the post it reminded me of my wood fire days, I used to put everything into saggers though.Good luck with the rearragements, I never did get ontop of bloating but I found a good outlet for all those pots, they went to reenactment educational groups playing out civil wars and medieval plays. They were delighted with them and at the rock bottom prices! 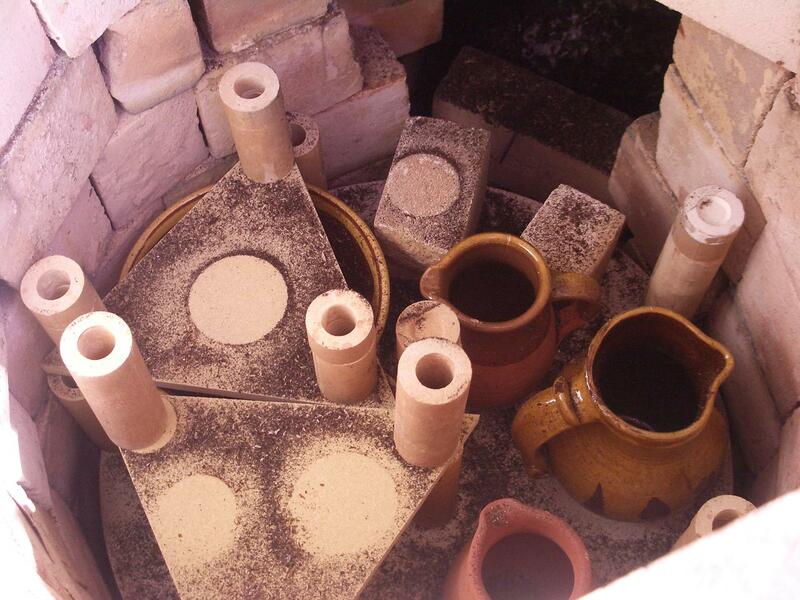 You could put some of those pieces in the electric kiln. The ash might then go in to the glaze a bit. Would be interesting to try on a few pieces.